1. World Curling Federation (WCF) rules apply, unless otherwise indicated below or explained at the Team Meeting (3 January, Prague Curling Club, 10:30). 2. 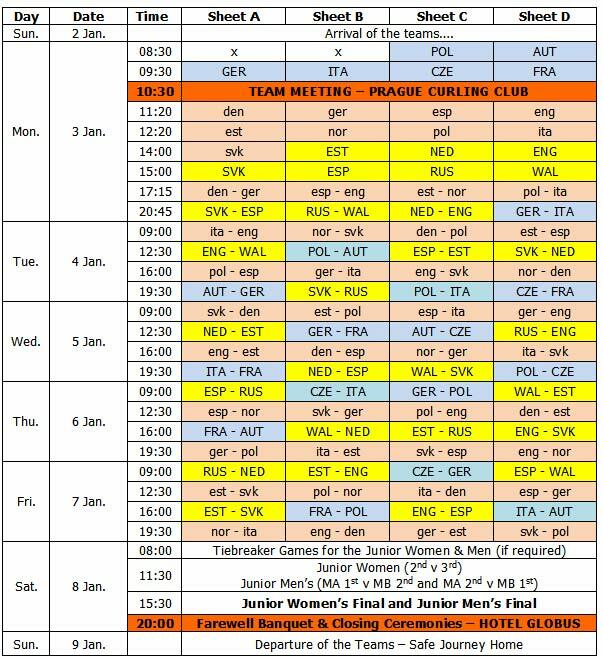 The Junior Women (9 teams) will be in one group and will play a single round-robin series. At the end of the round-robin series the team that is ranked in 1st position will advance to the final game, the teams ranked 2nd and 3rd will play a single game with the winner advancing to the final game. The winner of the final game will qualify their Association for the World Junior Curling Championships (WJCC) 2011. - the team ranked 1st from MA will play against the team ranked 2nd from MB, and the team ranked 2nd from MA will play against the team ranked 1st from MB. The winners of those games advance to the final game, and the winner of the final game will qualify their Association for the World Junior Curling Championships (WJCC) 2011. 4. All games will be eight (8) ends, with extra end(s) to break tied games. a) for the women and MA the team with dark stones practices first. b) for MB the teams must toss a coin during the Team Meeting to decide which team will have first practice in their first game ( GER v ITA, POL v AUT and CZE v FRA) thereafter, in the round robin the team with dark stones practices first. 6. At the conclusion of the team’s pre-game practice, one player delivers one stone to the tee at the home end (glassed end). The team with the lesser Last Stone Draw (LSD) has the choice of delivering first or second stone in the first end. If the LSDs are equal, a toss of the coin will determine which team has the choice. 7. First named team in each draw plays stones with dark coloured handles, and should wear dark coloured upper playing garments. Red is considered a dark colour. 8. The Chief Umpire will determine the schedule and ice for all post round-robin games as soon as the number of games required and the opponents have been determined. NOTE: The Monday training sessions will be 12 minutes on each sheet, moving from A to B to C to D. The sessions will be controlled by the Umpires who will indicate the time that the teams change sheets. If there are no tiebreaker games on Saturday, 8 January the games will be 10:30 and 15:30.